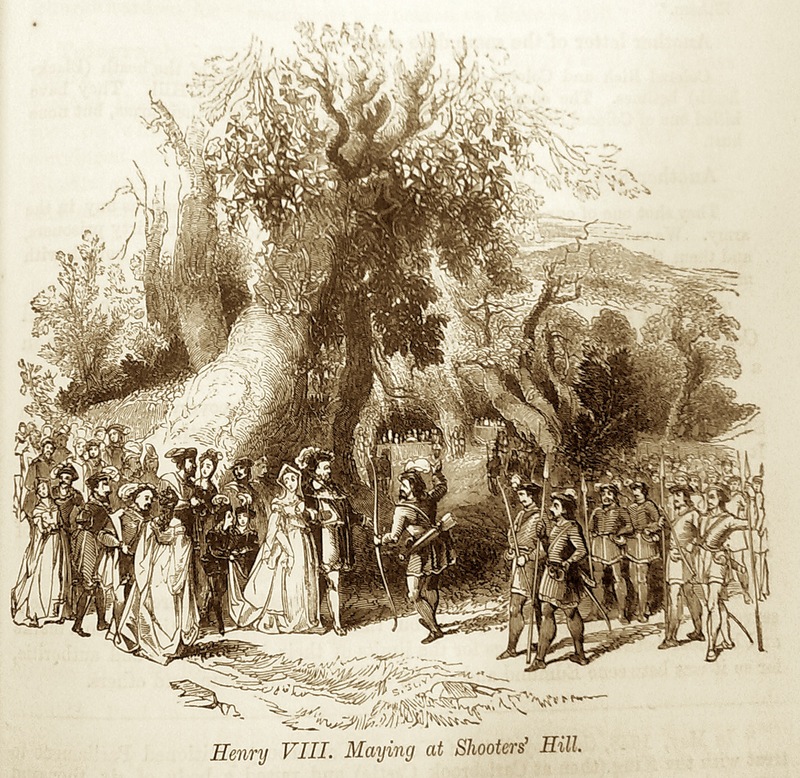 The King and Queen [Henry VIII and Queen Katherine] accompanied with many lords and ladies rode to the high ground of Shooters Hill to take the open air; and as they passed by the way, they espied a company of tall yeoman, clothed all in green with green hoods and bows and arrows, to the number of two hundred. Then one of them, which called himself Robyn hood, came to the King, desiring him to see his men shoot, and the king was content. Then he whistled and all the two hundred archers shot and loosed at once, and then he whistled again, and they likewise shot again; their arrows whistled by craft of the head, so that the noise was strange and great, and much pleased the King and Queen and all the company. All of these archers were of the King’s guard and had thus appareled themselves to make solace to the King. 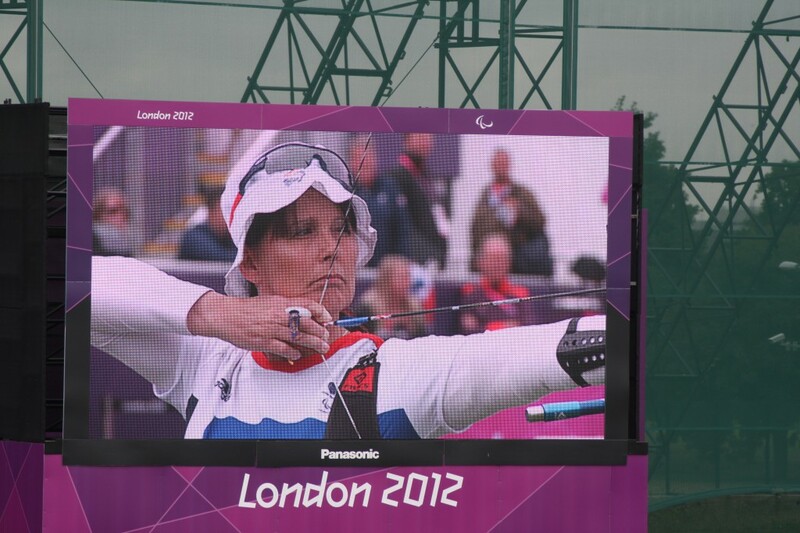 The archery at the paralympic stadium on Woolwich Common was, of course, very different. 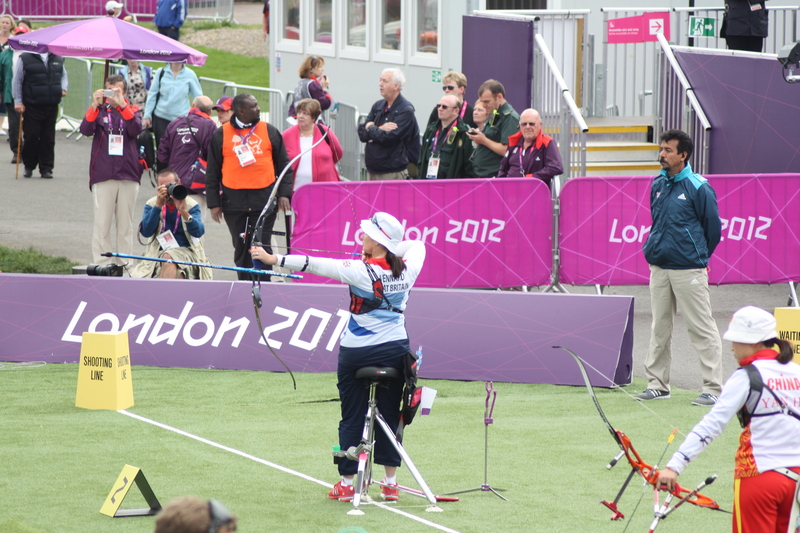 There are probably more than 200 archers at the paralympics, they shot their arrows individually and in silence rather than all at once and the only strange and great noise was the audience applauding the archers who hit the gold area of the target and (especially loudly) any British competitors. I must admit that I visited the stadium as much out of curiosity about the strange structures transforming Woolwich Commmon as out of any great interest in archery and shooting, but once there I found the competition completely compelling. It was very easy to get infected with the loud and enthusiastic audience atmosphere, whether clapping and stamping along to We Will Rock You or silently willing the British competitor’s arrow into gold. 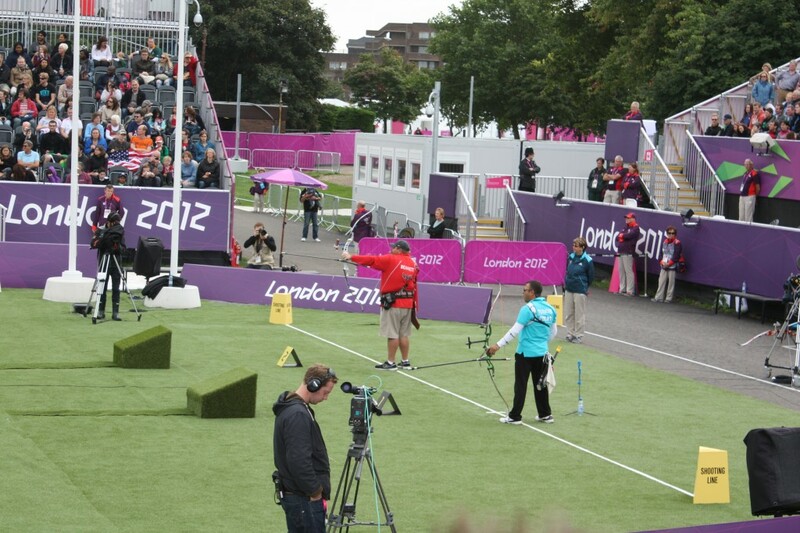 After the Games the 10/50m and 25m ranges and shot net will go to Glasgow for the 2014 Commonwealth Games; the large final hall is likely to remain in Greenwich. The dramatic temporary halls have been nick named ‘Teletubby Land’ and the site will be returned to Woolwich Common once the Games are finished. But it’s not all gloom; a memorial of Woolwich Common’s role in the Olympics is planned by the Olympics Development Authority. They propose to place three brightly coloured teletubby window at the side of Ha-Ha Road. And no, it’s not April 1st, I checked.